Full Mental Health Infographic: Download Mental health on campus has recently become one of the biggest concerns for higher ed institutions across North America. The number of students suffering from poor mental health is increasing at an alarming rate, and institutions are finding it harder than ever to tackle this issue. A recent study found that 73% of students experience some type of mental health crisis while in college or university. These crises often happen during high-stress periods, such as exam time, or mid-semester evaluations. A mental health crisis may include, but is not limited to, a student feeling depressed, anxious, paranoid, or emotionally distraught. While some argue that this phenomenon is due to our student population becoming less resilient, others suggest that the pressures students face today, such as higher tuition or increased academic competition are the main contributors to these mental distresses. 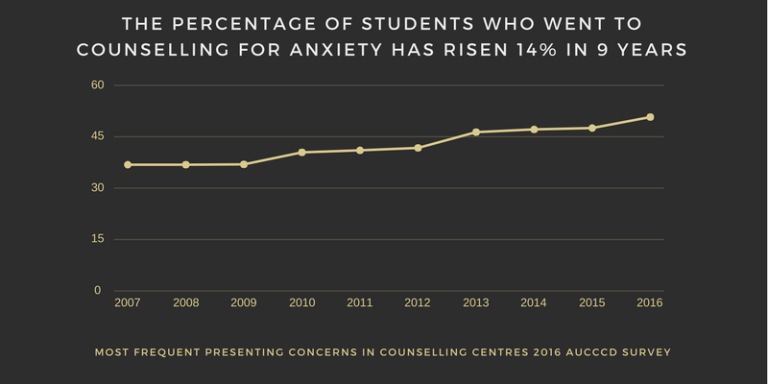 Over the past 9 years, campus counseling centers have seen a 14% increase (from 36.7% to 50.6%) in students seeking treatment for anxiety. As of 2010, anxiety surpassed depression and relationships problems as the main reason students are asking for help. While the number of students suffering from mental health crises is constantly increasing, higher ed institutions are finding it difficult to meet this new demand for mental health services. In a recent study, it was found that only 12% of community colleges have a psychiatrist or other licensed provider on hand to administer mental health services to students in need. Due to the gravity of this problem, paired with the limited resources needed to treat it, we must look to innovative ways to overcome the mental health crisis affecting students. By adopting a campus app, administrators are able to determine at-risk students by flagging key words (such as anxiety, depression, suicide, etc.) on the campus wall, and have the ability to intervene immediately through direct messaging or by suggesting counseling sessions. Another benefit of having a mobile campus platform is that students are able to connect to one another and offer peer to peer support. Oftentimes mental health crises don't happen during work hours, and having access to a digital community gives the struggling students an additional avenue to seek out help. Based on the trends we've been seeing over the past few years, it is clear that this problem is only getting worse. Institutions must be proactive in helping students overcome these mental health crises, and offer them as much support as possible. One step is to meet and converse with them where they are: on mobile.